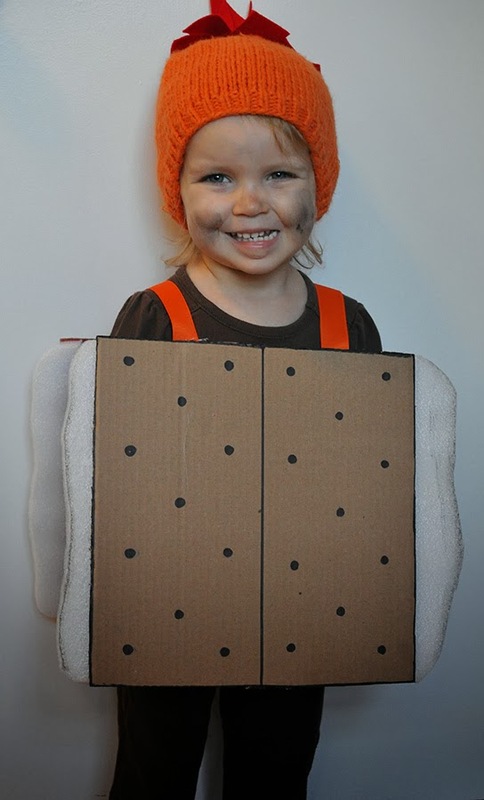 Greta will be transformed into an iconic campfire dessert for Halloween this year – the S’more! Greta’s costume this year came to me in a fit of unpacking, of course. It was simple to make and only took an hour or so of my time. Best of all, it fits over clothing and jackets, so depending on the weather, she can still trick-or-treat. 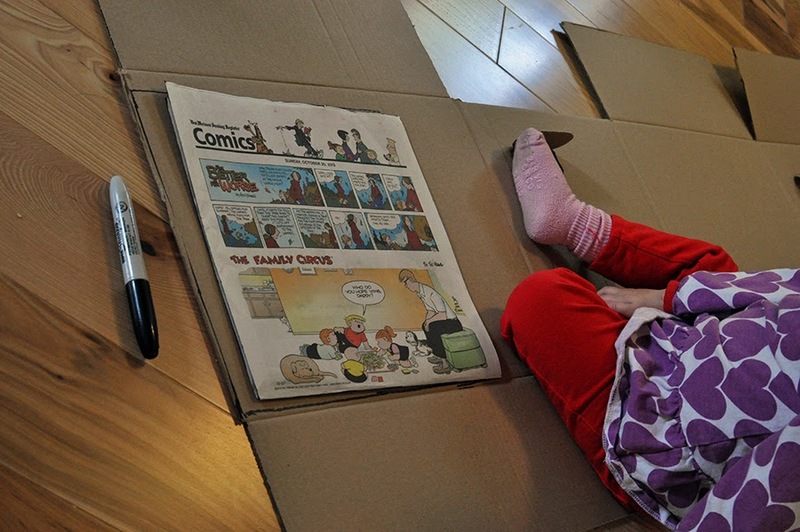 A piece of newspaper was the perfect size to use as a template for Greta’s small frame. 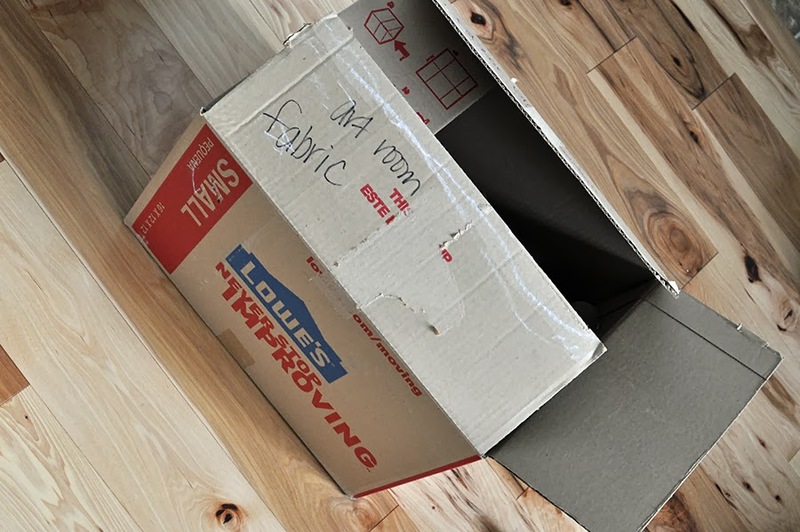 If you want to use a larger piece of cardboard, simply measure and use a straight edge with a right angle to make precise squares. After cutting out two identical squares from cardboard, I drew lines across the middle (only to realize later that they should have been dotted lines) for the sections of the graham crackers. I always draw in pencil first, tracing over with marker later. Then, I made three rows of dots in each section. I cut 4 sections of white foam (see above), with one straight edge and one free form, curvy edge. These were hot glued to the sides of the cardboard graham. Next, I measured across G’s chest and over her shoulders to find the best possible placement for the ribbons to hold her grahams. 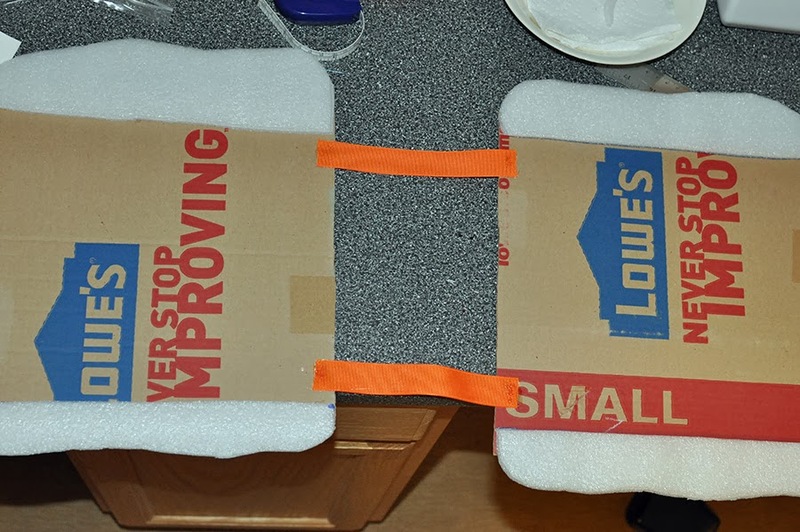 I marked them on the cardboard and glued them with hot glue. For her flame hat, I took an orange hat and safety pinned one layer of triangles made from red felt. I created a second layer of red triangles on top by hot gluing more triangles on top. See the first photo of this post for a more detailed image. You could also loosely hand stitch the red felt triangles on, I was simply trying to stick with the challenge of a no-sew costume this year. The finishing touches included brown clothing, to make her the chocolate bar, and a few smudges of drawing charcoal or black paint. I put these smudges on her nose, cheeks, and the edges of the white foam, for a burnt marshmallow look. This was sooooooo good. I took a classic chicken and wild rice casserole recipe of my grandmother’s and tweaked it just a tad to get this new winter classic. Best part? It is gluten-free, vegetarian, and dairy-free. This is what I needed this week – I have the annual crud. Moving to a new school, in a new state, with new germs finally took its toll on me. 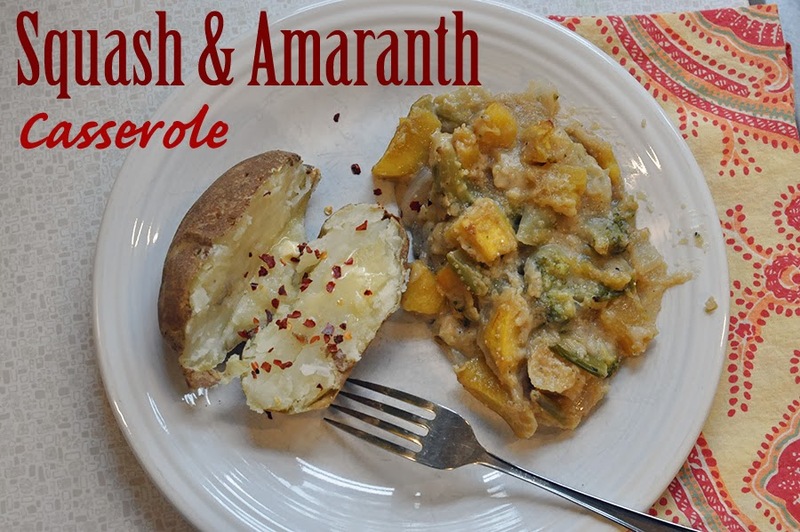 I am hoping for a speedy recovery, until then, enjoy this recipe. 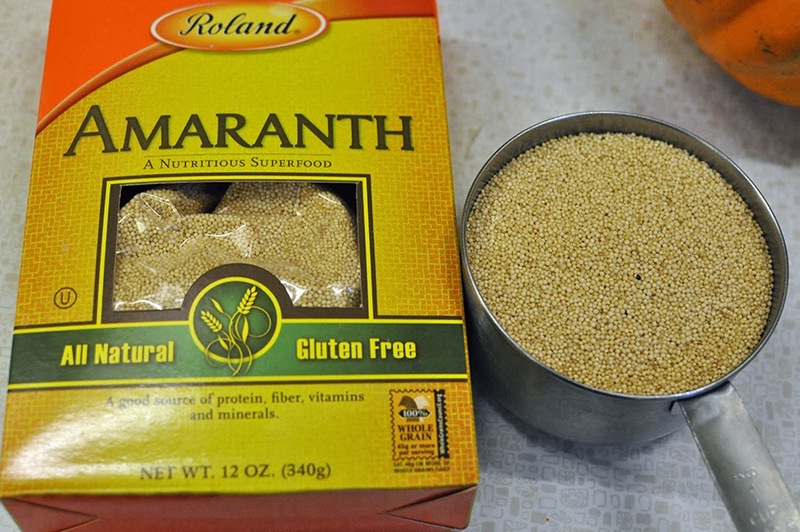 I used 1 cup of amaranth – it is like a finer version of quinoa – in place of the wild rice. It is so tiny that I was skeptical at first that it would even add anything of substance to this recipe. One sliced and peeled golden acorn squash was substituted for the chicken. Then, I threw in some broccoli and onion for good measure. See what I mean about the amaranth being tiny? I made a white sauce, in essence, to pour over my veggies. This makes one very full casserole of food, I promise. Eric and I both found ourselves going for for seconds and looking forward to leftovers. It is substantial comfort food without any discomfort from meat, dairy, or wheat the next day. 1. Saute 1/2 yellow onion, diced in 2 tablespoons margarine until soft. Add 2 more tablespoons margarine to onions, cook until melted. Stir in 1/3 cup rice flour, 1 teaspoon salt, and 1/2 teaspoon pepper. Cook over low heat, stirring until bubbly – remove from heat. Stir in 2 cups vegetable broth and 1 cup almond or coconut milk. Heat to boiling, stirring constantly. Boil and stir for one minute. 2. Pour liquid into a 2 quart casserole dish. 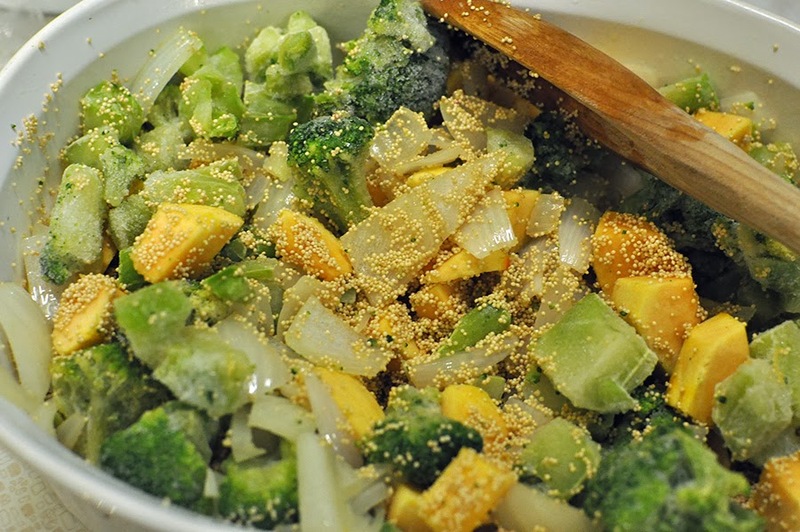 Add to liquid: 1 cut and peeled golden acorn squash, 16 oz of frozen broccoli, and 1 cup dry amaranth. Stir well. 3. Bake uncovered, 350 degree oven, until bubbly for 40 to 45 minutes. Serve warm. We went out to a birthday dinner with my mom at Cosi Cocina’s and had a delicious butternut squash soup. This soup is my version or interpretation of that soup. It is a perfect fall flavor soup with the heartiness to make it a meal. It is vegetarian and even could be made vegan with a simple swap of the dairy for a non-dairy milk. I would opt for a coconut milk or coconut creamer, for the best flavor and consistency. To really cut corners, and make a fast meal, one could easily use a can of cream of potato soup instead of the potatoes and the dairy. 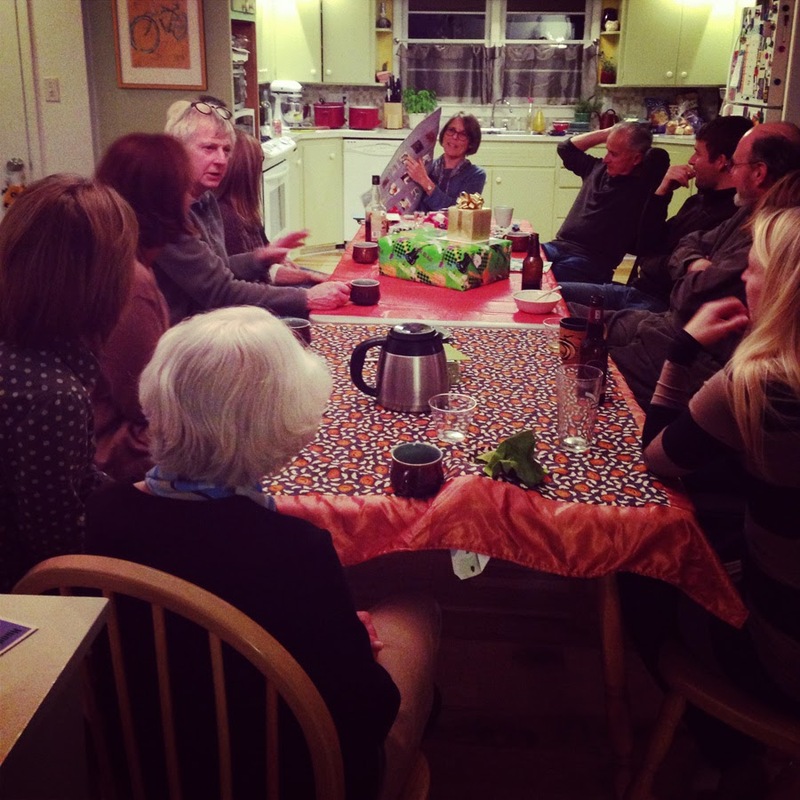 We hosted a belated party for my mom on Saturday night at our house. 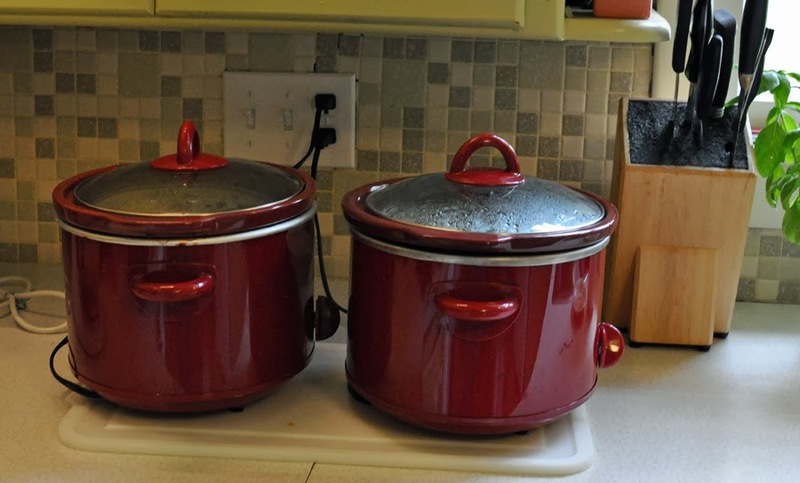 We were expecting 17 people total, so I doubled the recipe to make 2 crock pots of this soup. It paired perfectly with dinner rolls and we even had a little left over. 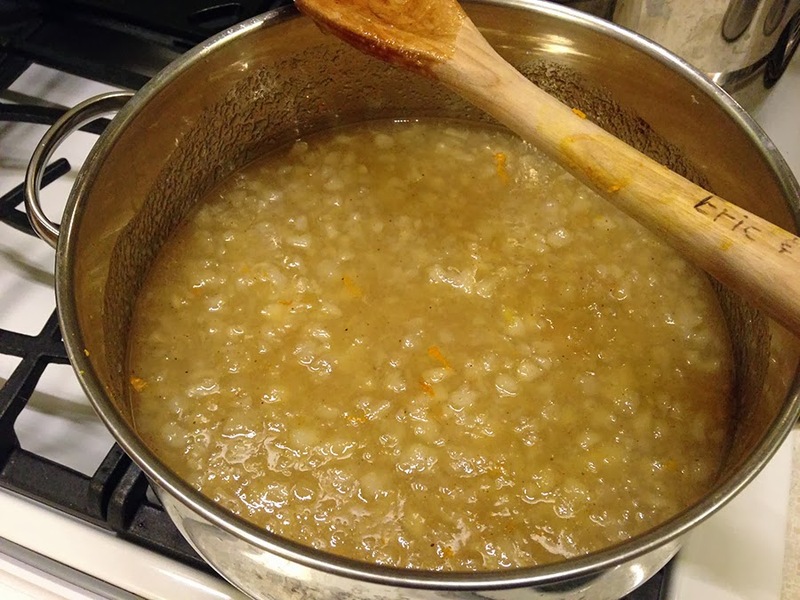 The soup’s vegetables are potatoes, onion, garlic, butternut squash, and celery. 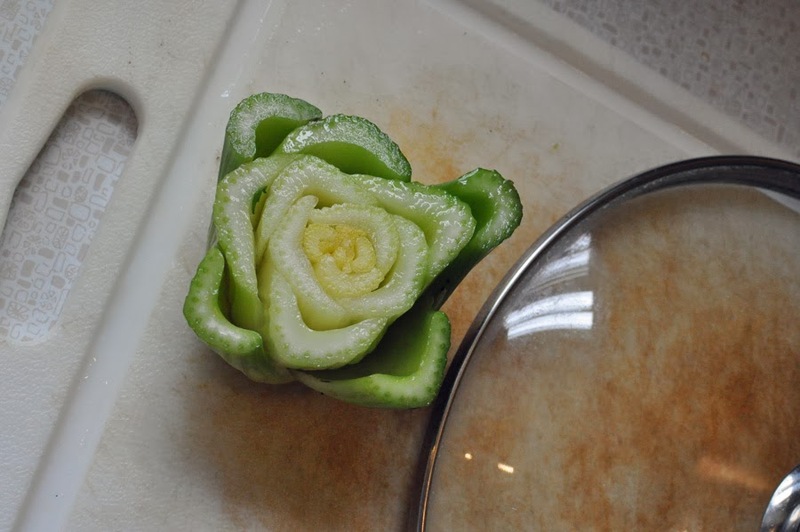 Did you know that you can use the base of a celery bunch as a stamp to create flower designs? 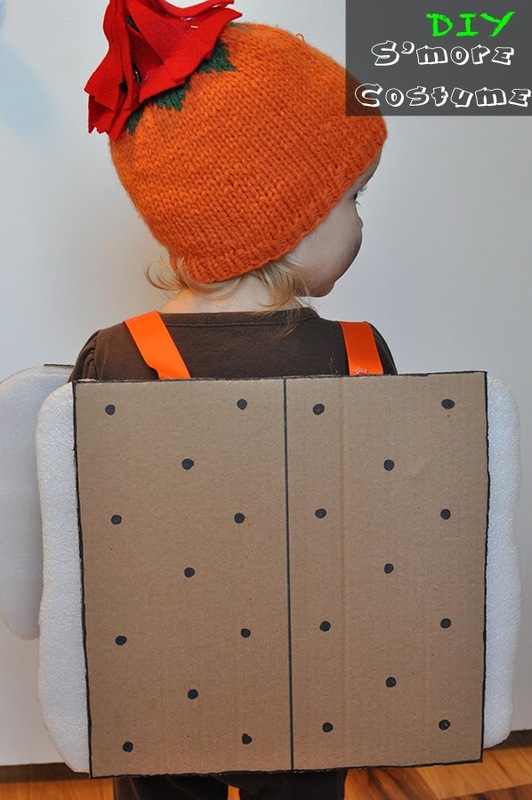 I am going to attempt this craft with Greta’s help. I will show you the results, promise. 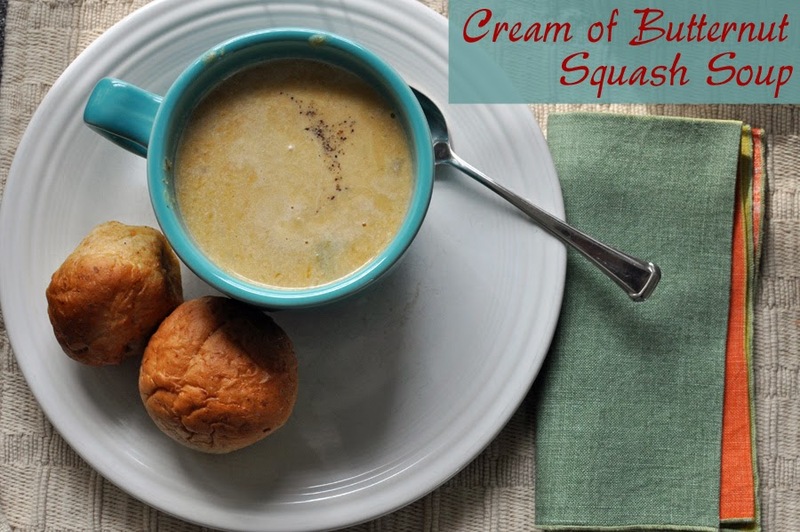 One roasted butternut squash plus a can of pureed butternut squash creates the base flavor for this soup. 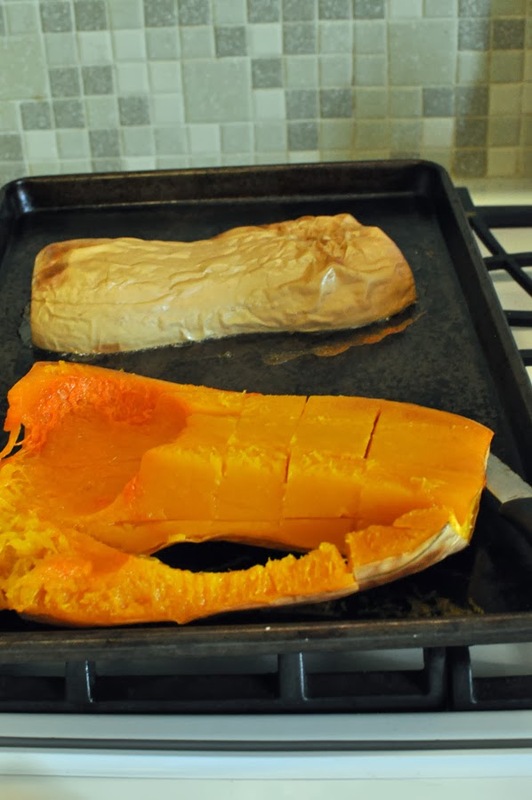 After roasting the squash allow it to cool, then create cross hatched lines with a knife and scoop out squash flesh with a spoon. We had a very full house. My mom is at the head of the table here, enjoying her milestone birthday I asked people to bring haiku poems to share with my mother in honor of her birthday. We collected them in a blank book. My directions were not entirely clear and everyone thought they had to write the poems themselves. Whoops! She is holding a beautiful quilt made by a friend, Fern. The quilt’s pattern followed a haiku structure – 5 blocks, 7 blocks, and 5 blocks. All I can say is thank goodness for friends, family, good food, good times, and folding tables! 1. 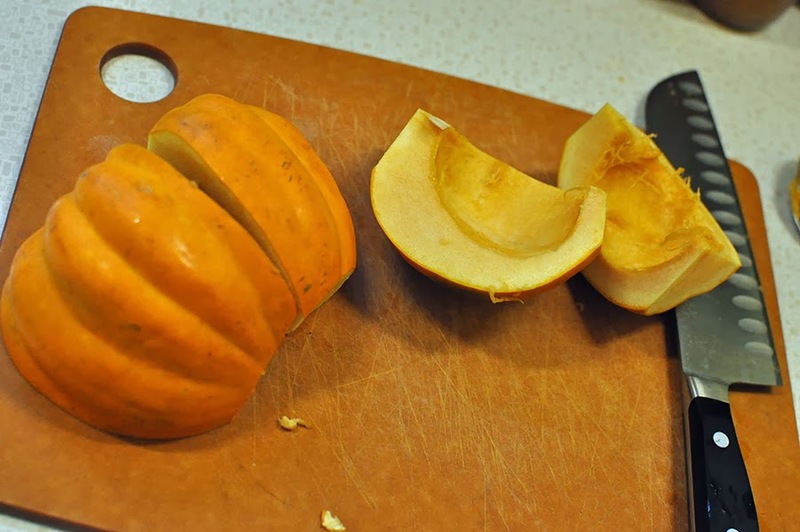 Cut 1 butternut squash in half. Remove seeds and roast at 350 degrees for 35 – 40 minutes or until soft. Allow to cool. Cut cross hatched lines into squash, remove flesh with spoon. 2. In a medium saucepan over medium heat, saute, 1/2 yellow onion, diced until soft. Add 2 minced cloves of garlic, saute another 2 minutes. Put onion mixture into slow cooker. Add 6 cups of vegetable broth. Turn slow cooker on high. 3. Peel and dice 3 large baking potatoes. Add to slow cooker. Add 6 sliced stalks of celery to slow cooker. Mix in 1 can of butternut squash puree. Add salt and pepper to taste. Put lid on slow cooker and cook on high for 4 – 5 hours or low for 6 – 7 hours, or until potatoes are soft and tender. 4. Once potatoes are cooked, add butternut squash chunks from 1/2 of the roasted butternut squash. Add 1/2 teaspoon ground cinnamon and 2 tablespoons maple syrup, stir. 5. In the last 5 minutes before serving, stir in 2 cups cream, half-and-half, or coconut creamer and 1 tablespoon tomato paste. I have been using up the apples I have left with various recipes – pie and apple sauce as of lately. Rather than tossing all the yummy peels, I put them all into a large bowl, toss with spices and bake to make a crunchy tasty snack. I have an apple pie and 3 jars of applesauce from the apples that belong to these peels. Obviously, I was working with a large quantity of apples. It is easy to adapt and change this recipe in accordance to the number of apples and your own taste buds. I had to pay attention as I made the apple peels today, as I usually do not measure anything when making this snack. 1. Place 3 cups apple peels into a large bowl. 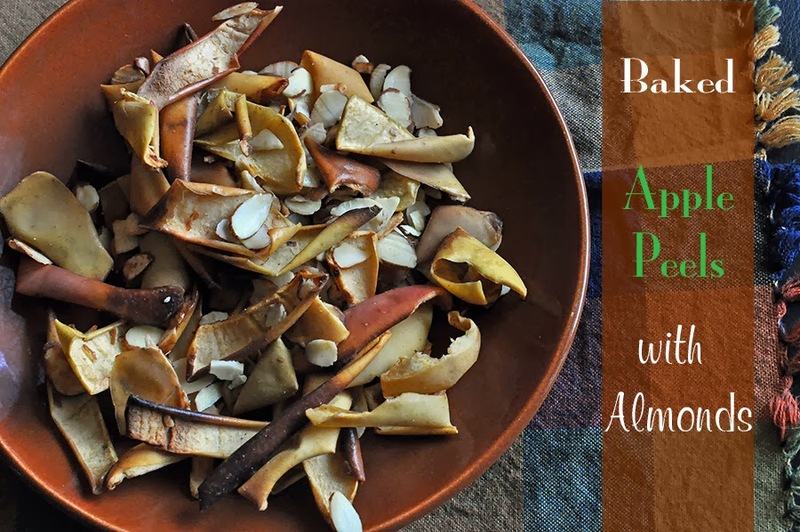 Sprinkle with 1 tablespoon cardamon, 1/4 cup sugar, and 2 oz of sliced almonds. Toss to coat evenly. 2. Lined a rimmed baking sheet with aluminum foil. Spread apple peels evenly in pan. Baked in a 350 degree oven for 25 to 30 minutes or until slightly browned. Stir half way through baking. 3. Remove from oven, allow to cool before serving. Store in the fridge in an airtight container or freeze to save even longer. This is yet another one of those cell phone camera only posts. I have been dropping the ball on my photography skills here lately. 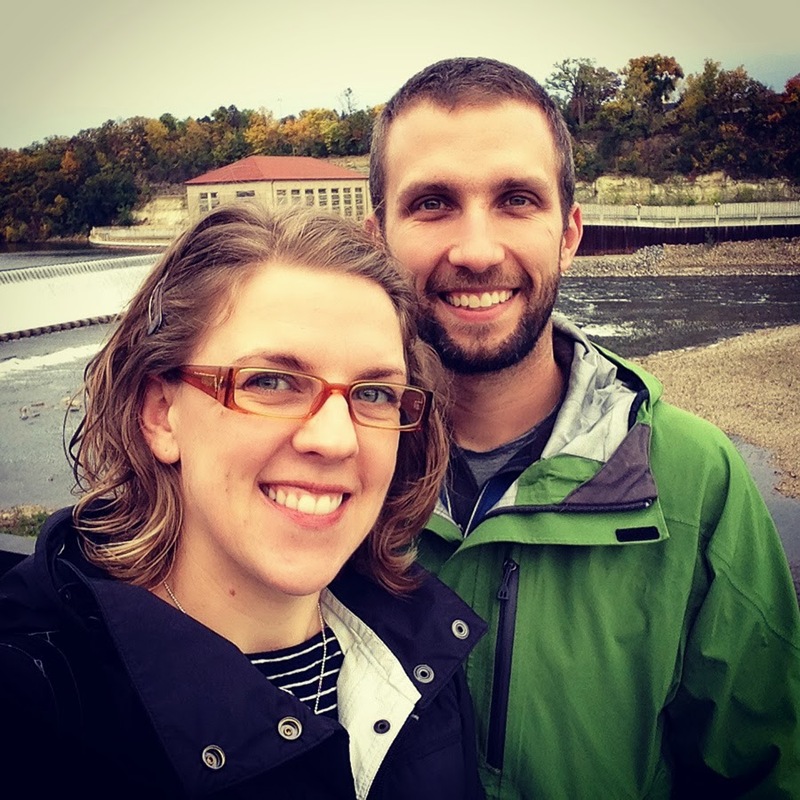 However, it was our anniversary this past weekend and so we took off for Minneapolis for the weekend for a much needed relaxation time with my sister and her husband and friends. 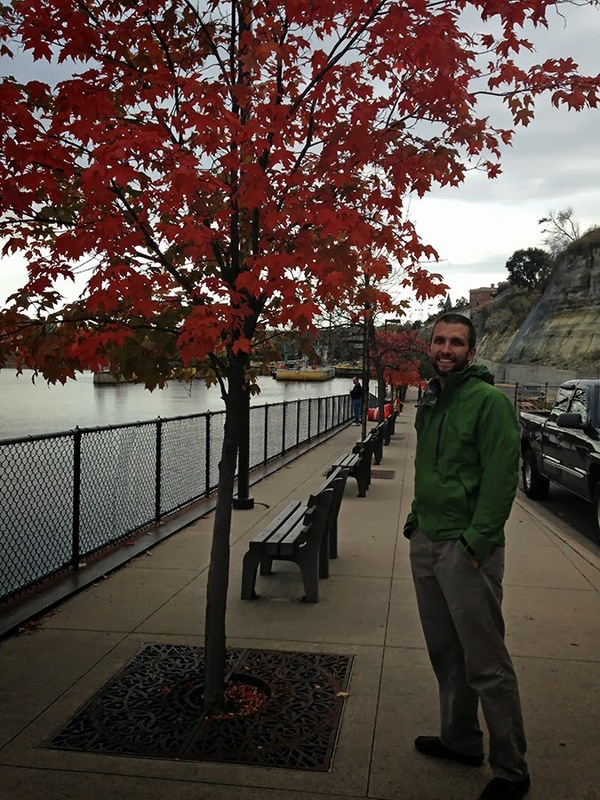 Minneapolis was fully into autumn by the time we arrived. It was a chilly and slightly rainy weekend. We started off Friday evening with dinner with my sister. Then on Saturday made a run to Ikea for Swedish pancakes and household items. We managed to all nap (!) 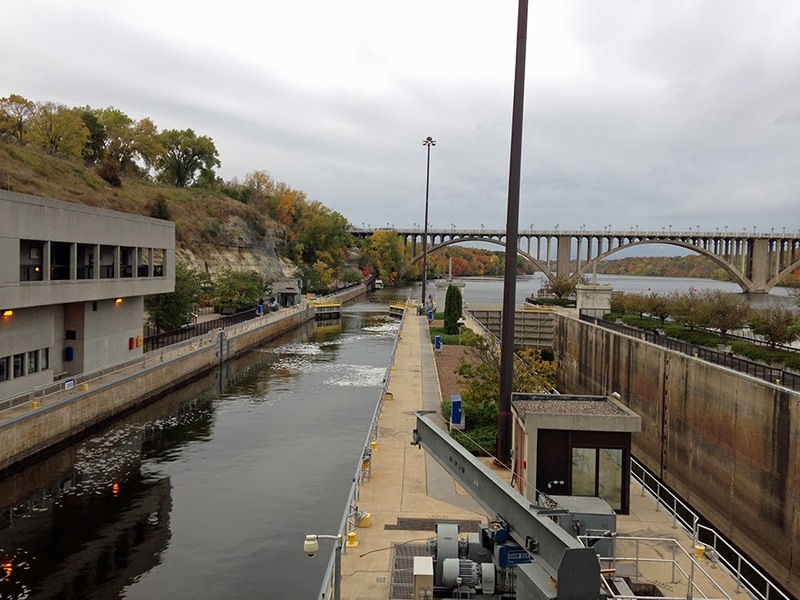 and then Eric and I took off to explore lock and dam #1 on the Mississippi River in Minneapolis. 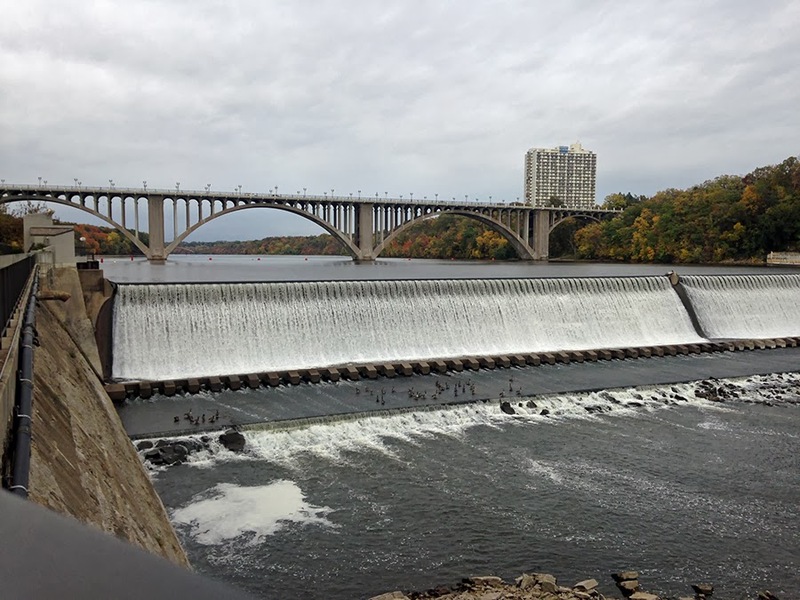 The mighty Mississippi is quite impressive, as were the fall colors along its bank this weekend. Eric and I hung around long enough in the chilly weather to see 2 kayaks and 1 houseboat pass through the lock. It has been years since I was last at Lake Superior watching the huge iron ships pass through its locks – hopefully we will go North again soon. 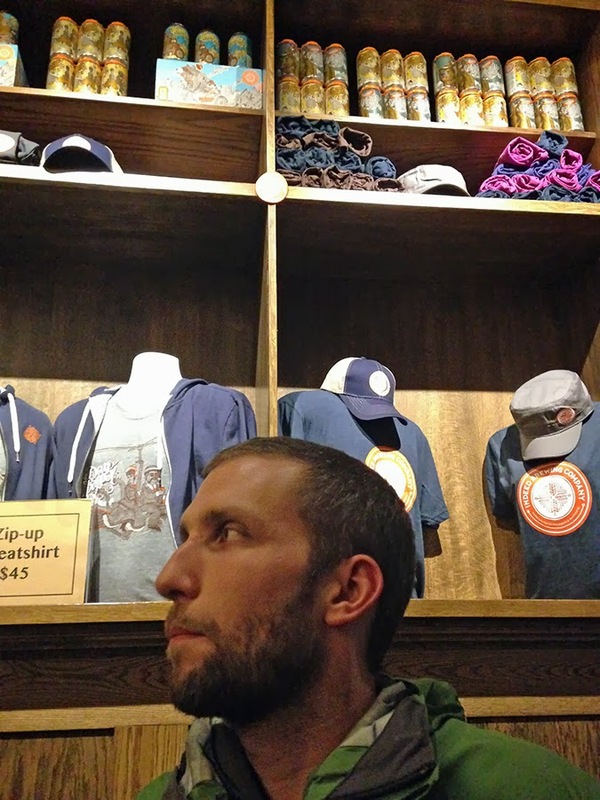 Chilled to the bone, we decided to meet up with friends at a few of Minneapolis’ breweries. 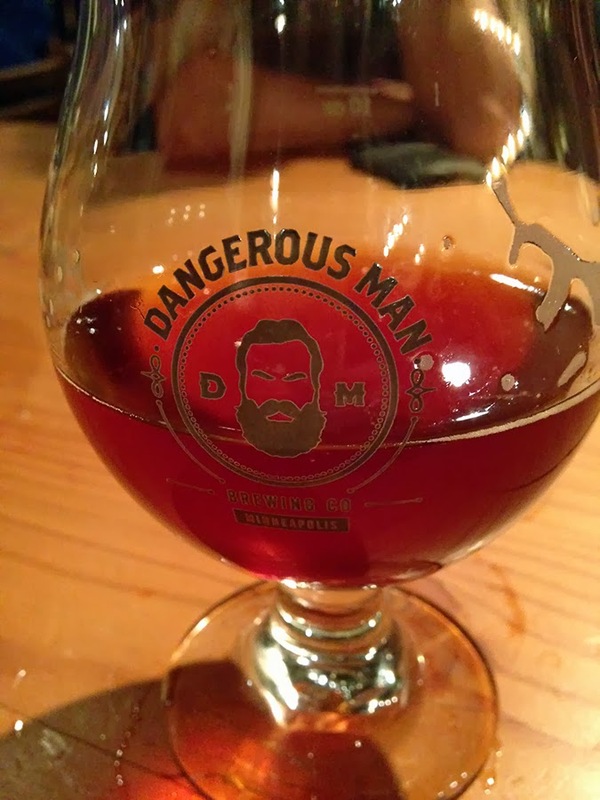 Dangerous Man was first on the list. The brewery is only a brewery, however, patrons are able to bring in their own food. So we dined on wood fired pizza from Element Pizza whilst sipping Oktoberfest, Chocolate Milk Stouts, and ESBs. We hopped over to Indeed Brewing next. This place has a much larger bar area and a patio outside facing the train tracks – it reminded me of the Asheville beer scene so much. The artwork on the shirts, cans, and 6 packs are all done by a local artist. We ended the night with polka music and drinks at Nye’s Polonaise Room. This is a bar you truly must experience yourself – live polka music, a photo booth, gold glittery upholstered booths, and hearty Polish food. No photos I can take will ever do it justice. I do however regret that there are no photos of my sister or our friends from this weekend. I am sorry, I guess I did not remember to take photos, and when I did, they were horrible with blurriness galore. I guess it just means we are destined to be in Minneapolis again soon! We drove back to Des Moines on Sunday to a very excited daughter. She spent the weekend with grandparents, very willingly, I might add. This family portrait captures her love of rolling around trying to knock us over (onto the lovely new rug in the living room). Greta was in bed by 6:30 and then it was time for Walking Dead. My decor was all ready and lit for the occasion. 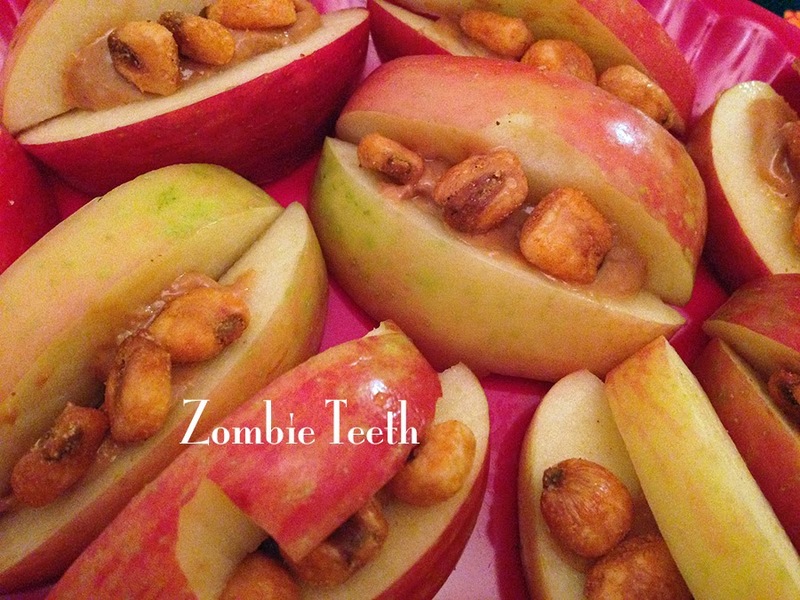 I made a three course zombie theme meal – zombie teeth appetizers. These consisted of apple slices with peanut butter, and corn nuts for teeth. The original idea (from Pinterest, of course) used almonds for teeth, but I found corn nuts to be a whole lot creepier and tastier. 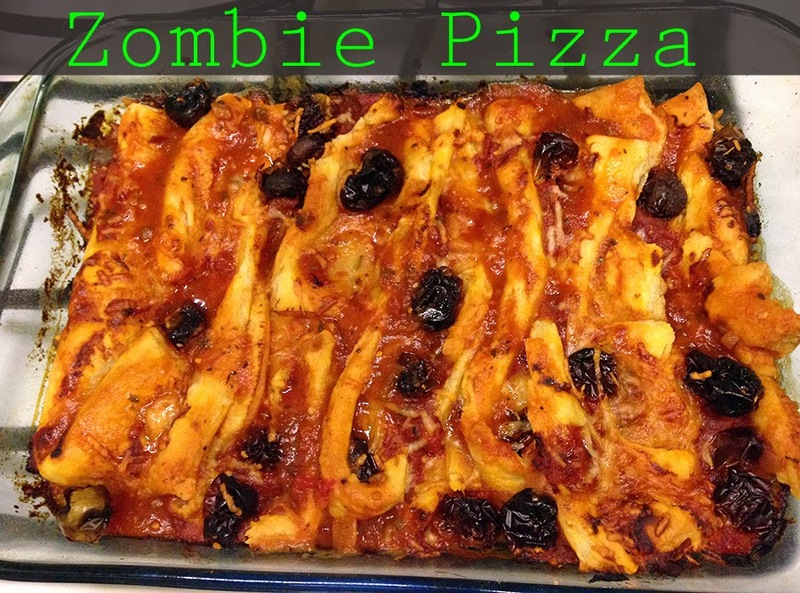 Zombie pizza was next. This consisted of two sheets of puff pastry wound around in a 9 x 13″ pan. It was then smothered in pasta sauce and topped with shredded Parmesan cheese and dried tomatoes. Bake it in the oven for 20 – 25 minutes at 425 or until slightly browned on the top. The original idea comes form My Crazy Life. The final touch to this zombie meal isn’t as zombie-like as the first two ideas, but it was equally as tasty and easy to make. 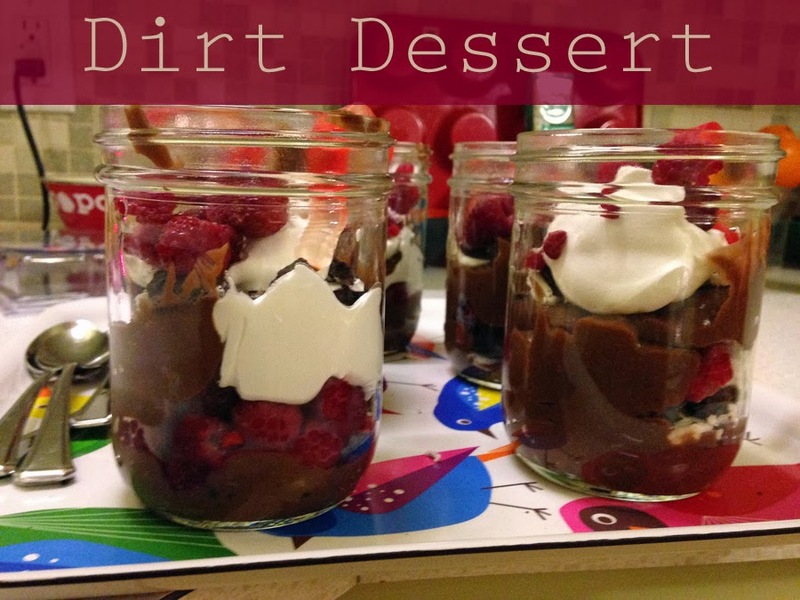 Dirt Dessert is simply layers of chocolate pudding, crumbled Oreo cookies, whipped topping, and red raspberries. Top with a gummy worm for a little more Halloween fun. This pear butter is heavenly – pear flavored with a spicy nutmeg hint and it is slightly bitter due to the blood orange rind and juice. It was the fastest round of canning I have done yet. As I said before, I am addicted to canning and am looking for more unique combinations of jams, jellies, and butters. 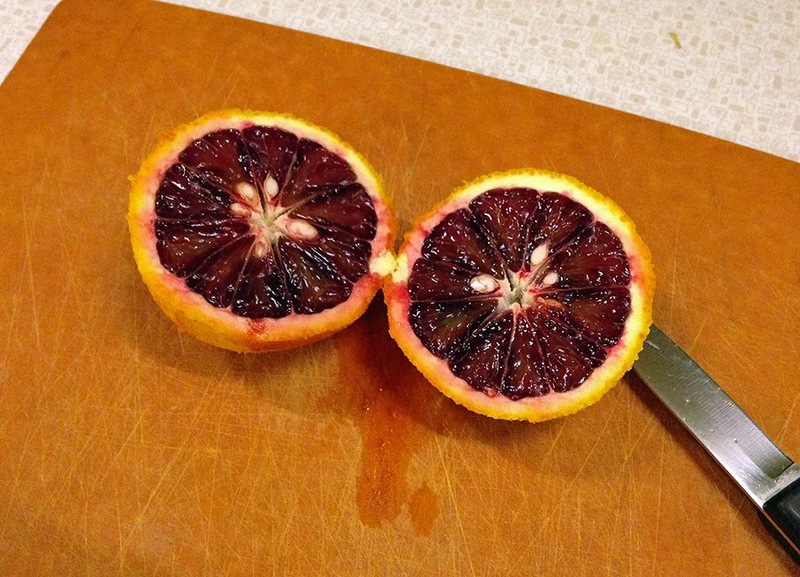 The pear pulp before the blood orange juice was added – still quite yellow in color. After adding the blood orange, the pear butter will turn into a lovely shade of pink. To prepare pulp: wash pears. Core, peel, and slice pears. Combine pears and 1/2 cup water in large saucepot. 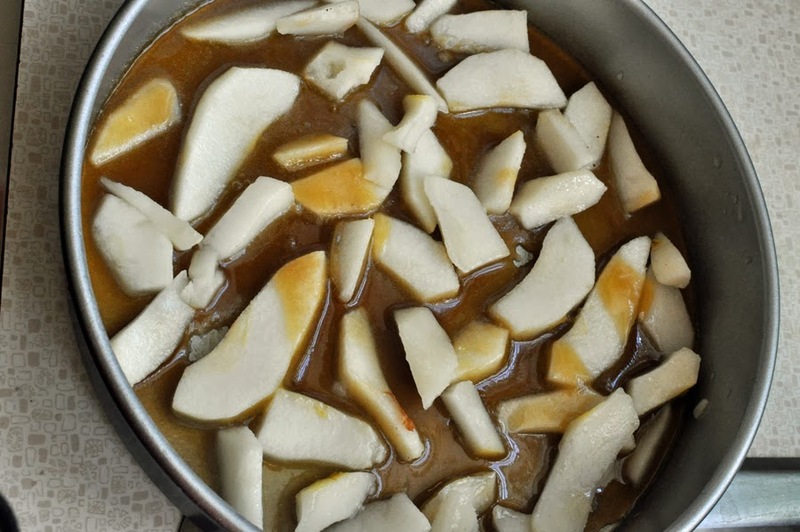 Simmer until pears are soft. Puree using a food processor or food mill, being careful not to liquefy. Measure 2 quarts pear pulp. 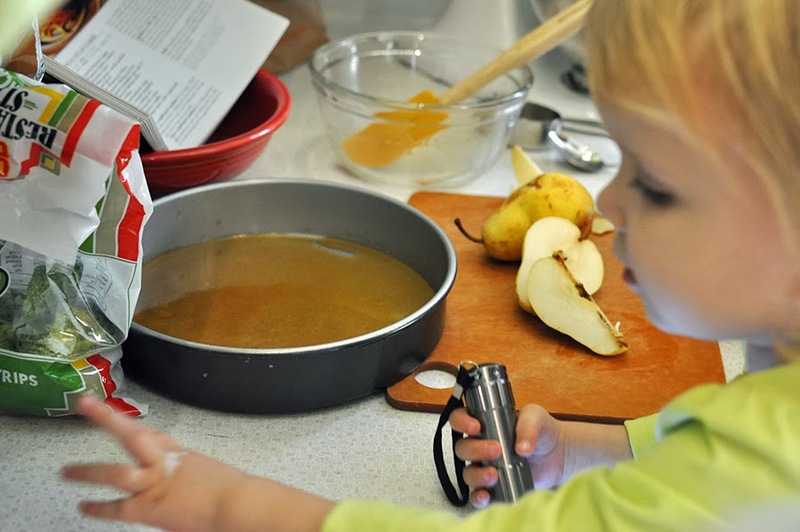 To make butter: Combine pear pulp and sugar in large saucepot, stirring until sugar dissolves. Add remaining ingredients. Cook until thick enough to round up on a spoon. As mixture thickens, stir frequently to prevent sticking. Ladle hot butter into hot, sterilized jars, leaving 1/4-inch headspace. Remove air bubbles. Adjust two-piece caps. Process for 10 minutes in a boiling-water canner. Ok, I admit, I am generally NOT a TV person. I can find so many better ways to spend my time instead of zoning out in front of the screen – in other words, I am make myself too busy. However, there are a few times when a show captures my attention. And oh man, October 13th, I am so ready! I have been eagerly awaiting the return of The Walking Dead all summer. I have been biding my time on Sunday evenings with Breaking Bad – much more of an Eric show than a Chelsea show. However, Sundays are back to my show in less than a week. 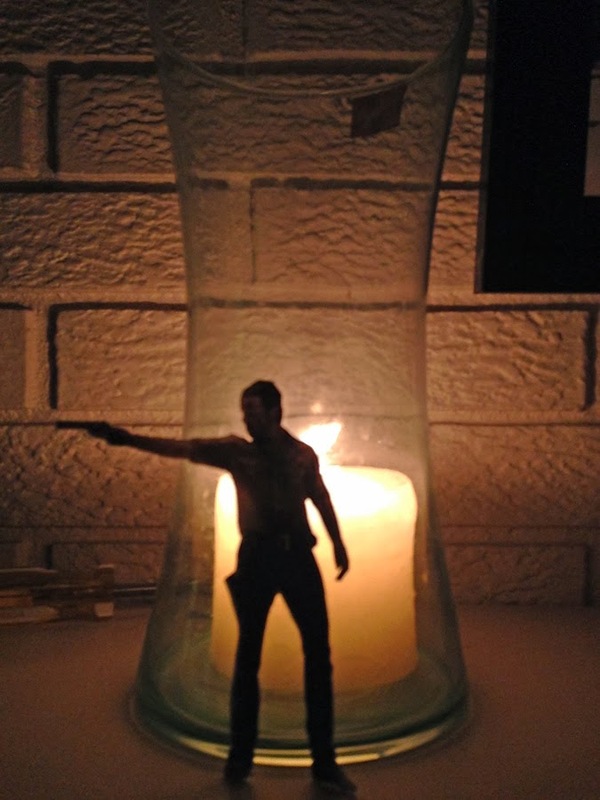 This easy silhouette is on my mantle and ready for Sunday (If you are a fan, a friend, and in Des Moines, give me a holler.) 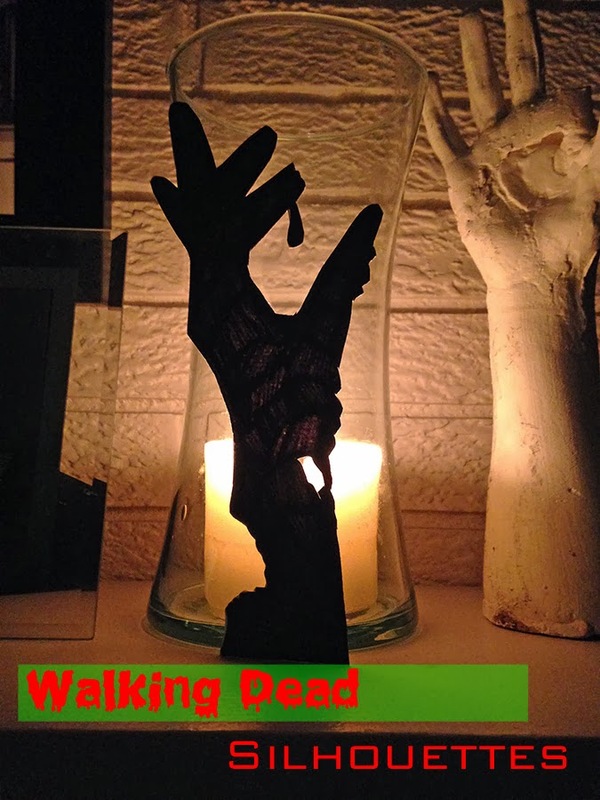 Below are a couple easy ways to decorate for Halloween or your Walking Dead premiere party, if you are a geek like me. 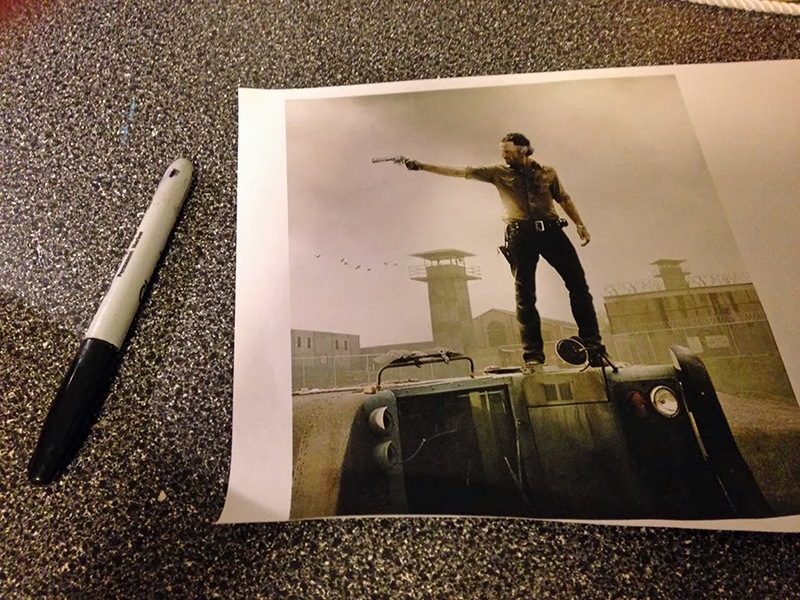 I started with a print off of an image of Rick. 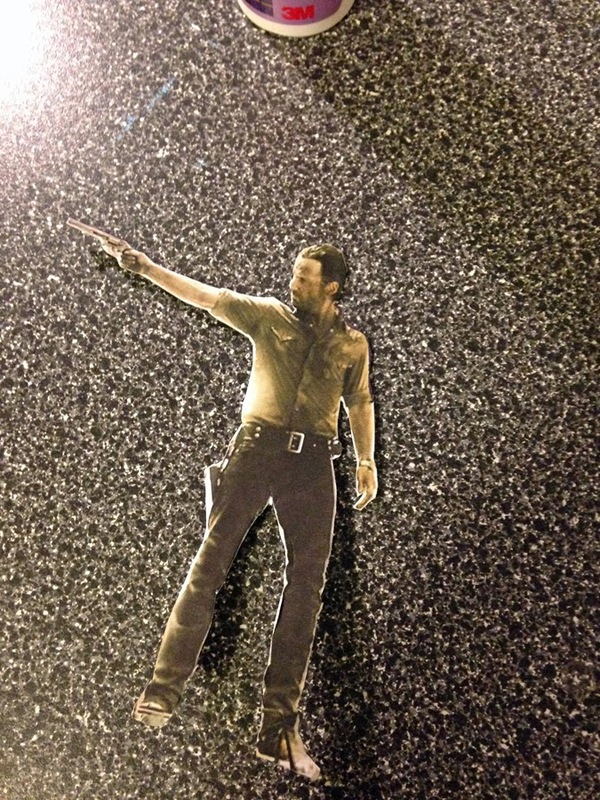 I cut him out and glued him onto card-stock. 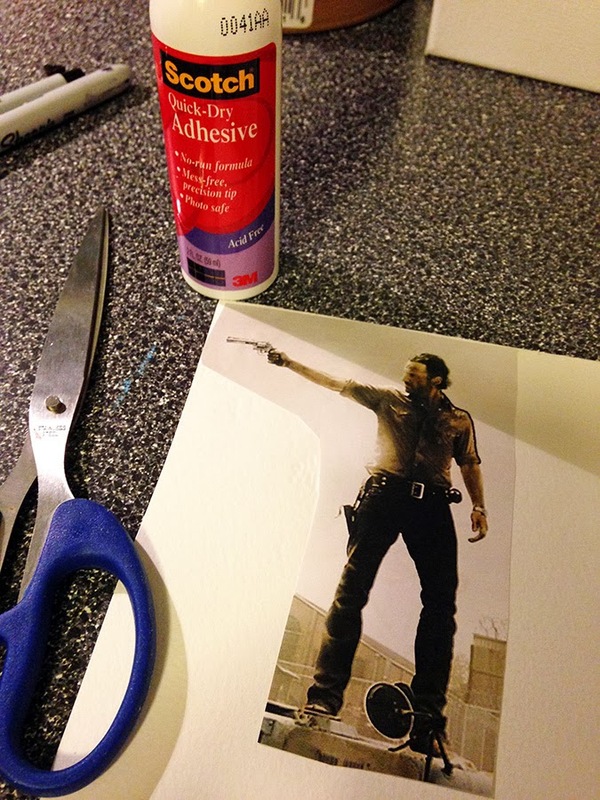 This quick-dry adhesive by Scotch is a great craft glue – I highly recommend it. Here is my little Rick all ready to go. 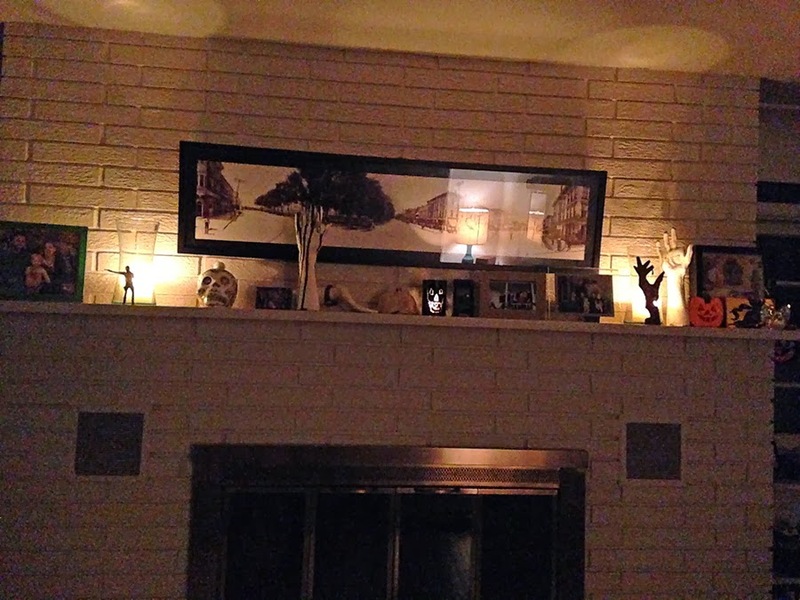 Simply place in front of a hurricane candle holder, light the candle, and voila! You have instant decor. 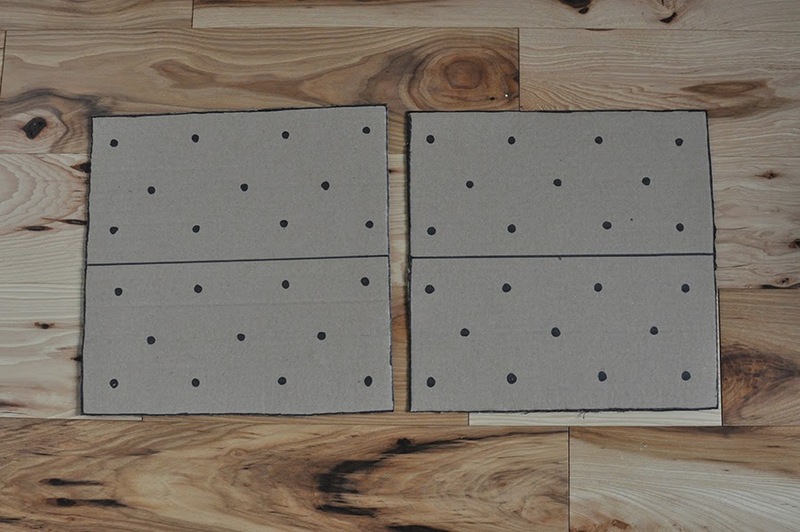 These can also be placed on the inside of lamp shades for a clearer, more diorama-like effect. I could see an entire line-up of the cast done that way. Click on this image to enlarge it, and then print on heavy paper. Cut out and then use a craft knife to cut some random holes on the inside of the hand as well. We had a nice weekend at home finishing up some more painting of hallways and organizing a few key areas of the house. It was rather gloomy and rainy all day Sunday – enough to warrant getting out the light down comforter and turning on the heat (low of course) for the night. We will have some adapting to do this winter – it will be a far cry from balmy North Carolina winters. We celebrated a milestone birthday with my mom on Sunday by going to dinner at Cosi Cucina. They have a to-die-for butternut squash soup that I am going to be recreating on here very soon. 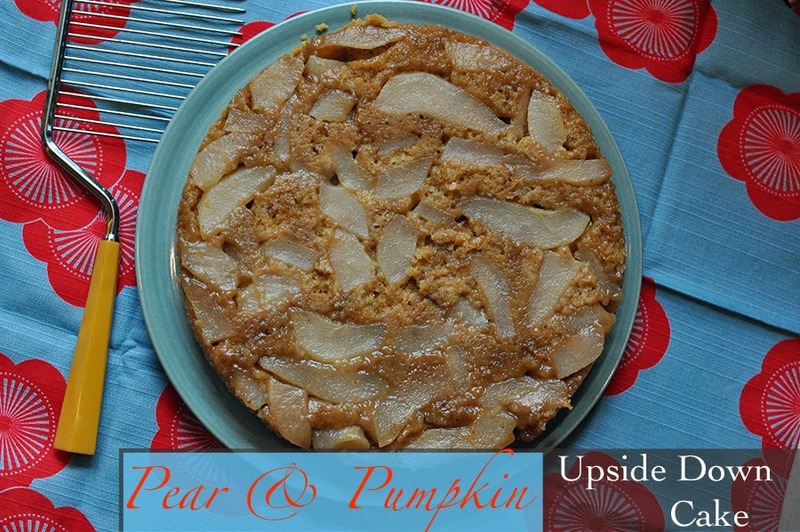 We all convened back at our house for this perfect autumnal cake – Pear & Pumpkin Upside Down Cake. Greta was a huge help in the preparation of the cake. Please note the flashlight that she shone on everything I was doing. The upside down layer is created with with a simple caramelized sugar glaze and sliced pears. These were pears from my parents’ trees, of course. The cake itself is perfectly fall with pumpkin and pumpkin pie spice. 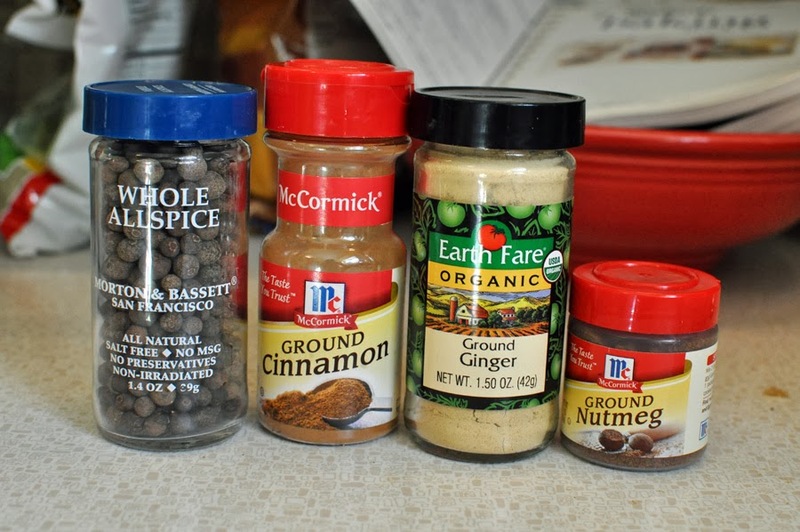 You can make your own pumpkin pie spice by combining allspice, cinnamon, ginger, and nutmeg. Read the note below on the proportions. This cake only uses the egg whites – whipped into a stiff sugary concoction. Pumpkin puree just plain makes me happy. If I was allowed to, I would use it in every recipe all day long. The final batter is spread carefully on top of the pear layer and baked until perfection. This cake creates a smaller cake with 10, single layer servings. It is perfect for a small gathering. If you wanted to double it, use a second pan! 1. 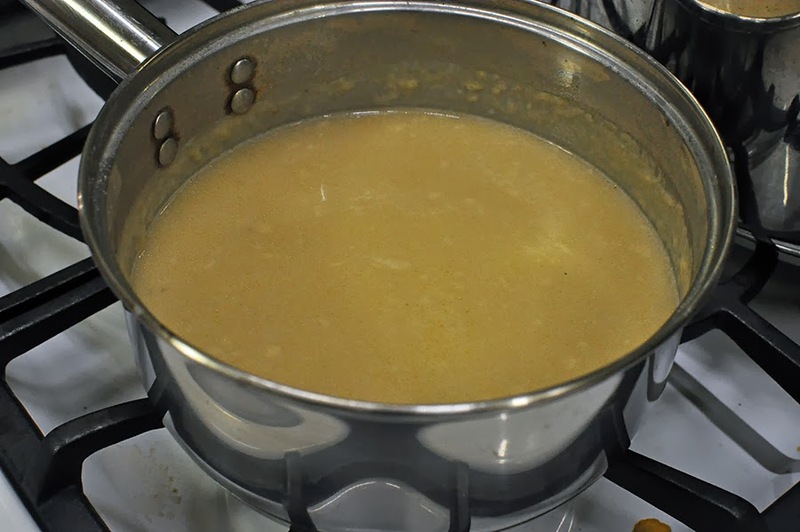 In a small bowl combine: 1/3 cup packed brown sugar, 2 tablespoons melted butter or margarine, and 1 tablespoon water. 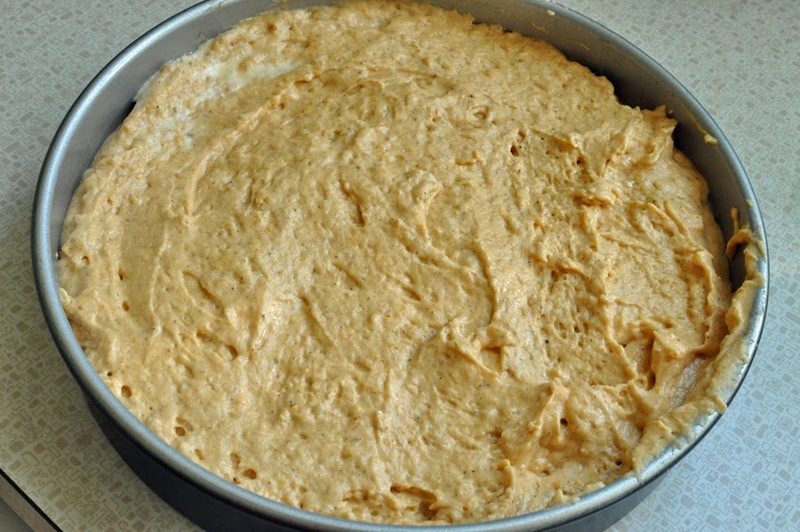 Pour into an ungreased 9×1-1/2 inch round baking pan. Core, peel and slice 2 medium pears. Arrange the pear slices in the pan. Set pan aside. 2. In a small bowl combine: 1-1/4 cup all-purpose flour, 1-1/4 teaspoons baking powder, 1 teaspoon pumpkin pie spice*, and 1/4 teaspoon baking soda, set aside. 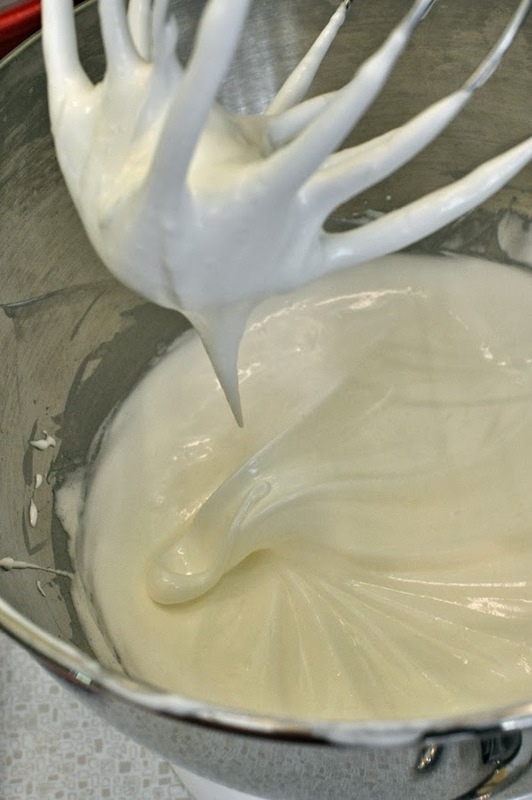 In another mixing bowl beat 3 egg whites with electric mixer or mixing stand, on medium speed until soft peaks form (tips curl). Gradually add 3/4 cup granulated sugar, beating until stiff peaks form (tips stand up straight). 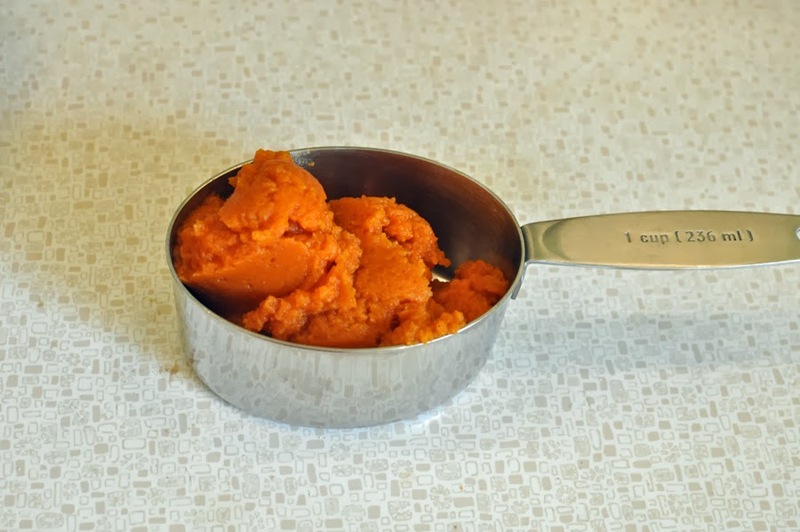 Using low speed, blend in 3/4 cup canned pumpkin puree, 1/3 cup cooking oil, 2 tablespoons water, and 1 teaspoon vanilla. 3. Bake in a 350 degree oven for about 35 minutes or until a toothpick or knife is inserted near center comes out clean. Cool in pan on wire rack for 5 minutes. Loosen from sides of pan; invert onto serving plate. Serve warm. *Note: 1 teaspoon of pumpkin spice can be made by combining: 1/2 teaspoon ground cinnamon, 1/4 teaspoon ground ginger, 1/4 teaspoon ground allspice, and 1/8 teaspoon ground nutmeg. 250 cal., 10 g total fat (3 g sat. fat), 6 mg chol., 120 mg sodium, 39 g carbo., 2 g fiber, 3 g pro. Daily values: 42% vit. A, 3% vit. C, 5% calcium, 8% iron. This wreath is an easy, DIY project using easy to find materials. I simply made a circle from wire and created a loop at the top in which to hang the wreath. Then, I glued ping pong balls to each other and onto the wire wreath with a hot glue gun. 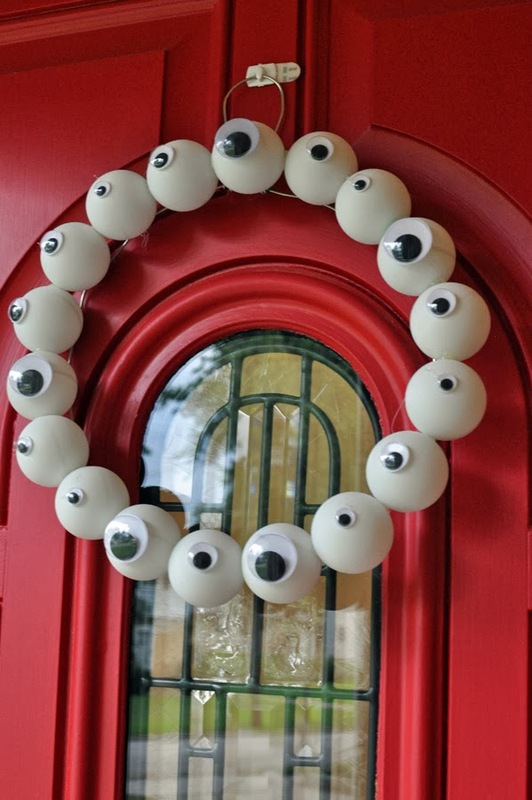 The finishing touch were googly eyes of varying sizes. It’s such a light weight wreath that it can be hung anywhere. If you wanted to make it more gory for your upcoming Walking Dead party (October 13th) you could add some red paint or marker to the eyeballs. Check back soon for more zombie theme ideas for the upcoming return of The Walking Dead. Greta picked out a white pumpkin at the garden center recently. 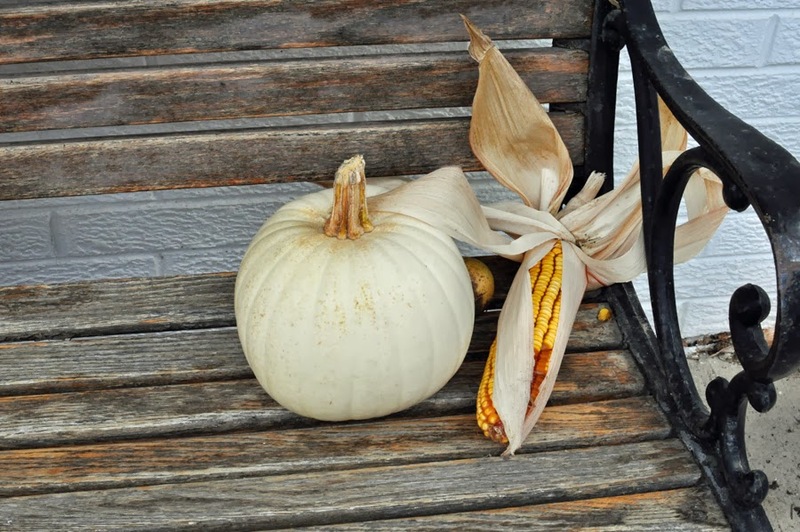 We have a lovely bench outside our house (in bad need of some TLC) where our fall decor sits. 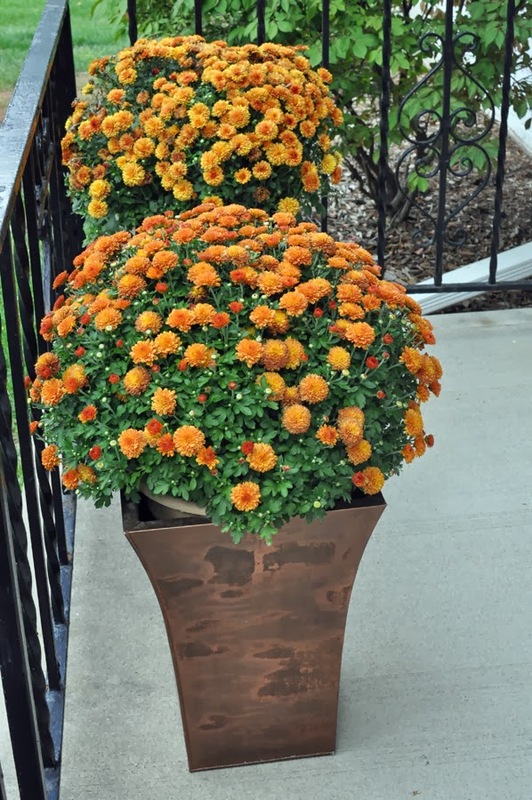 The orange mums are in copper urns that were used as decor in our October wedding some years back. Mums just scream autumn and I relish the first sight of them outside garden centers and grocery stores. 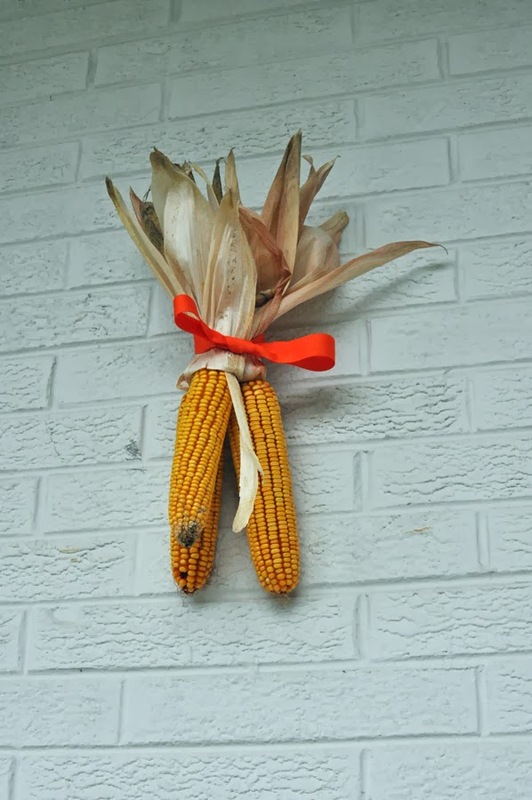 My mom brought me some ears of corn that I promptly tied together and hung on the handy nail outside our front door. This nail will no doubt be the home of wreaths and decor throughout the seasons. It’s been rather quiet on this blog home front lately. 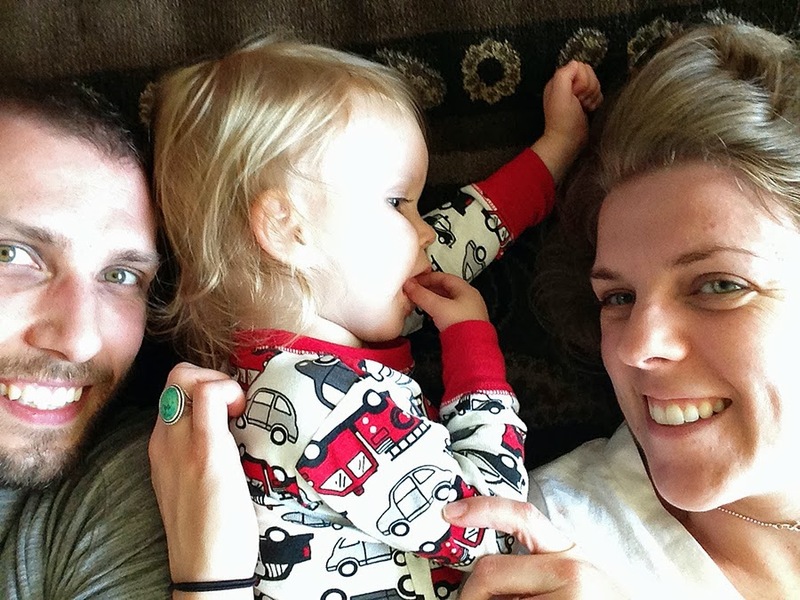 My family has been more than busy with work, life, family, and the likes. However, I do allow myself to indulge in some of my creating hobbies even in the midst of storms. 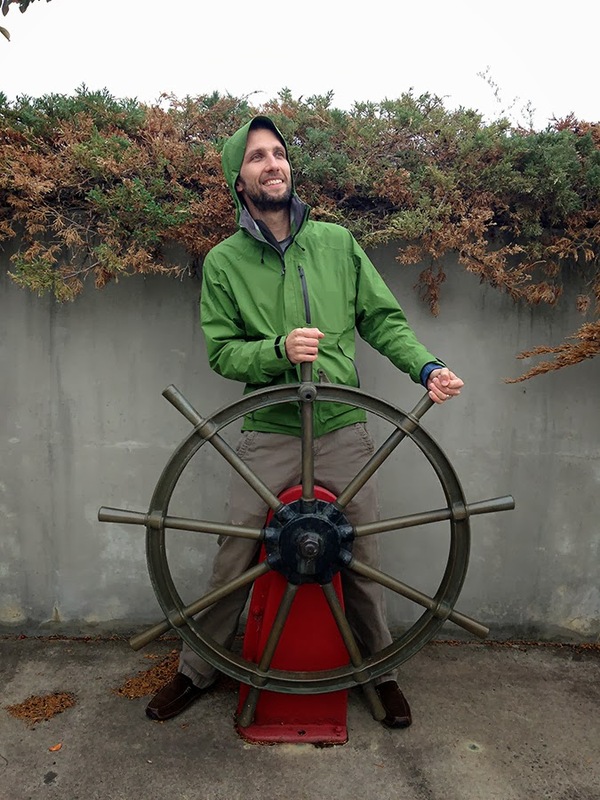 This post covers the topic of my most current creation focus. I am not even close to sorry for the low quality photos in this post. 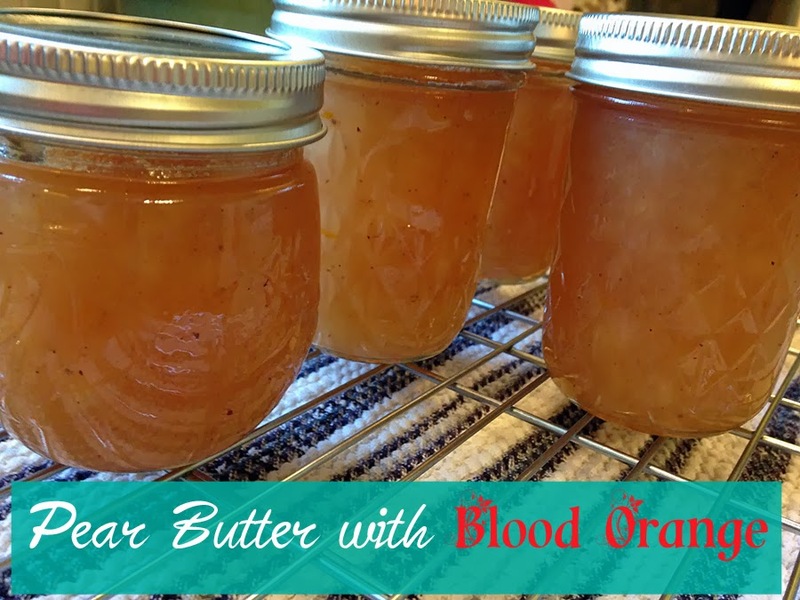 As I sit here and type, my brain is wrestling with itself on whether or not to hurry to the kitchen and continue the madness that is taking over my cooking, baking, blogging, and evening time right now: canning. I have become my parents. There, I said it, I am hooked on canning. I have been canning salsa and whole tomatoes for a week or two now. I do small batches that can easily be accomplished in the hours after Greta is in bed and before I am too tired to stand anymore. 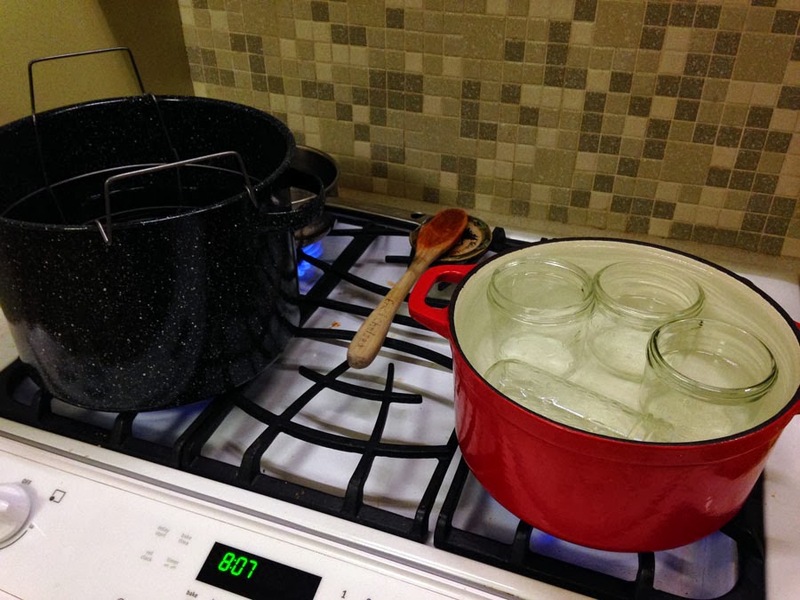 I used to fear canning, even though I witnessed it thousands of times as a kid. I always feared botching the entire batch of canned goods. However, upon moving back to Iowa, my goal was to overcome this fear. I had the kitchen space, I had the time, and I most certainly had access to all the produce I wanted from family and neighbor gardens. All I had to do was some research and acquire the necessary equipment. I headed off to the amazing place called Fleet Farm and bought a steel/porcelain canning pot with rack for processing, and jars, new lids (for my reused jars), a straining set (for when I make jelly), and a canning set complete with a funnel for filling jars, tongs, lid tool, magnetic jar lifter for removing lids from hot water, jar lifter, and jar wrench. Within a couple hours, I was enjoying my very own home made salsa. This batch is mild and sweet – easy on the spices. The next batches will be amped up a notch or two, for our family’s hot taste buds. I made a plea to Des Moines for its tomatoes, claiming I would never buy salsa again. Next time I may keep a little more quiet. I have two 5 gallon buckets of tomatoes waiting to be canned now. Why am I still sitting here? Time to get cracking! Next I’m working on Can Your Own Tomatoes. My mom. No really, find a family member or friend who has canned before and ask them to assist you on your first try. The Better Homes and Gardens Special Interest Publication, Canning. The Bell Blue Book of Preserving. 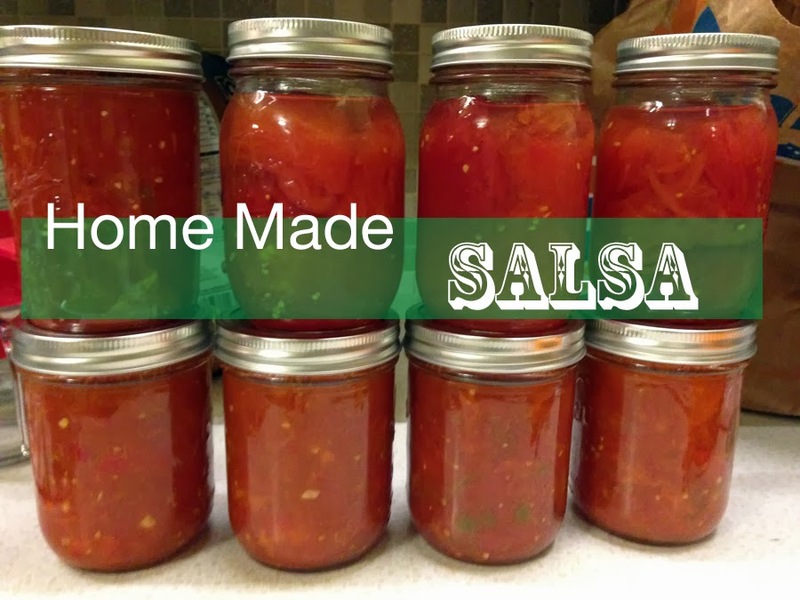 Home Made Salsa, from Better Homes & Gardens, Canning, 2013. 1. If desired, peel tomatoes. 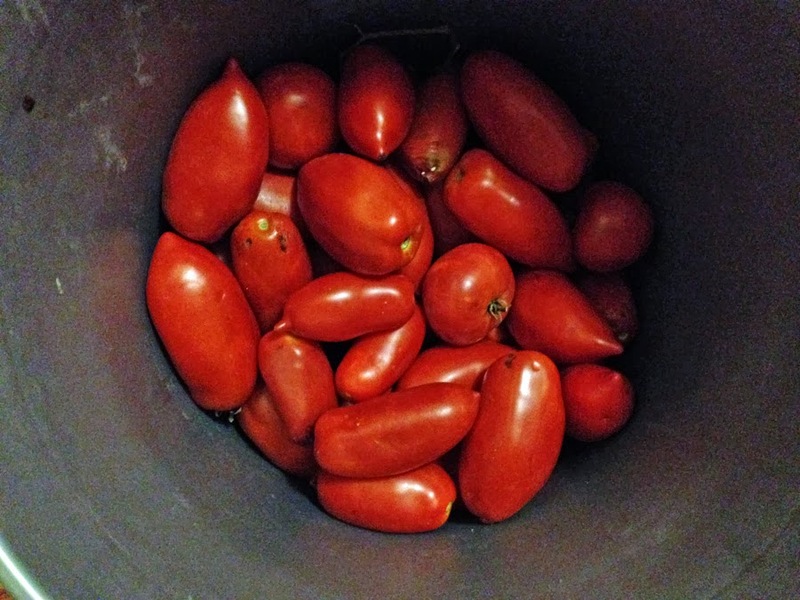 Seed, core, and coarsely chop tomatoes (you should have 14-15 cups of tomatoes total). 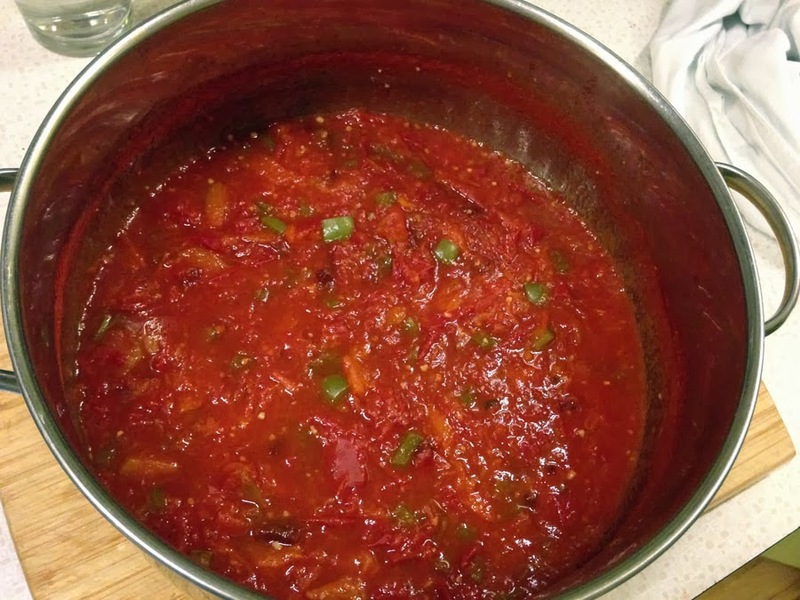 Place tomatoes into a 8 to 10 quart stainless steel, enamel, or nonstick heavy pot. Bring to boiling; reduce heat. Boil gently, uncovered for about 1 to 1-1/2 hours, or till thickened, stirring occasionally. 2. Stir in: 1 green bell pepper chopped, with ribs and seeds removed, 3 cloves of minced garlic, 1/4 teaspoon kosher salt, 1 teaspoon coarse ground black pepper, 1/2 cup lime juice, 1/2 cup white vinegar, 1 teaspoon cumin seed powder, and 2 -3 chipotle peppers diced. Return mixture to boiling; reduce heat. Simmer uncovered for 10 minutes. 3. 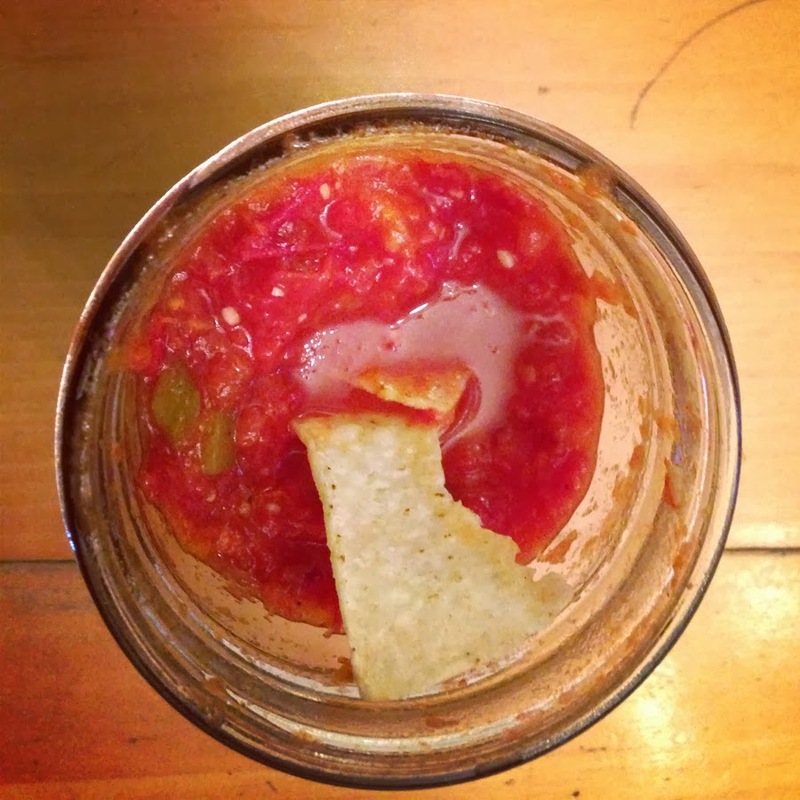 Ladle hot salsa into hot sterilized pint canning jars, leaving 1/2 inch headspace. Wipe jar rim; adjust lids and screw bands. 4. 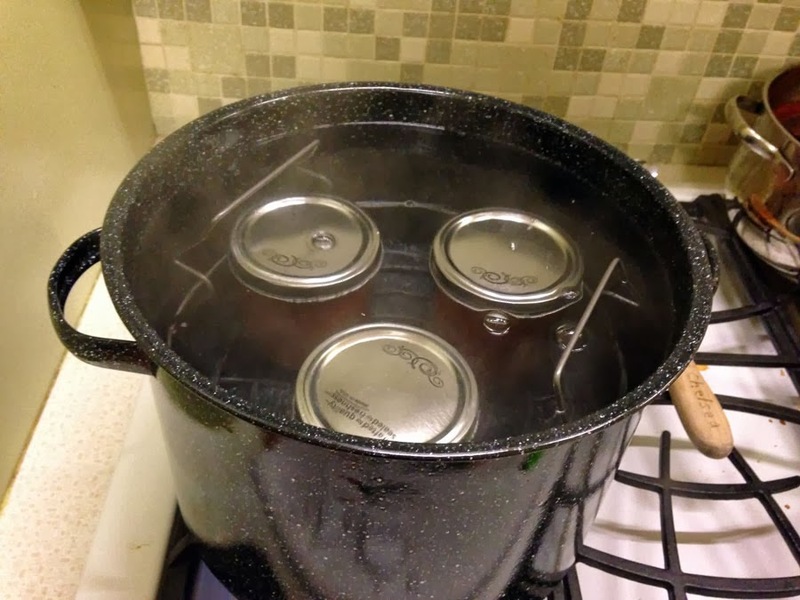 Process filled jars in boiling-water canner for 15 minutes (start timing when the water returns to a boil). Remove jars from canner; cool on wire racks. Makes 5 pints.